The evolutionary implications of recombination in HIV remain not fully understood. 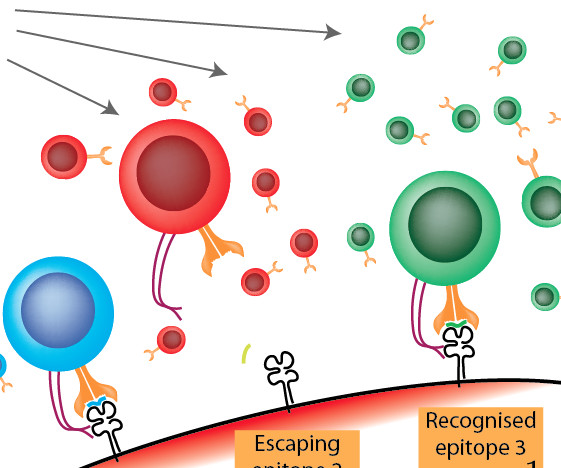 A plausible effect could be an enhancement of immune escape from cytotoxic T lymphocytes (CTLs). In order to test this hypothesis, we constructed a population dynamic model of immune escape in HIV and examined the viral-immune dynamics with and without recombination. Our model shows that recombination (i) increases the genetic diversity of the viral population, (ii) accelerates the emergence of escape mutations with and without compensatory mutations, and (iii) accelerates the acquisition of immune escape mutations in the early stage of viral infection. We see a particularly strong impact of recombination in systems with broad, non-immunodominant CTL responses. Overall, our study argues for the importance of recombination in HIV in allowing the virus to adapt to changing selective pressures as imposed by the immune system and shows that the effect of recombination depends on the immunodominance pattern of effector T cell responses.